All Henderson Dores dreams of is fitting in. But America, land of the loony millionaire and the subway poet, down-home Bible-basher and sharp-suited hood, of paralyzing personal frankness and surreally fantasized facilities, is hard enough for an Englishman to fit in to. Henderson could never shed enough inhibitions to become just another weirdo. Or could he? This hilarious fish-out-of-water comedy, which Boyd also adapted for screen for the 1980s film starring Daniel Day Lewis, was described in the "Guardian" as, 'splittingly shrewd and engaging ...with an extra and uneasy little something fretting away at the ribald content'. 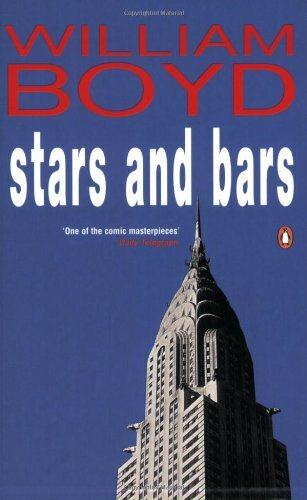 rved and brilliantly plotted, Stars and Bars is an uproarious portrait of culture clash deep in the heart of the American South, by one of contemporary literature’s most imaginative novelists. A recent transfer to Manhattan has inspired art assessor Henderson Dores to shed his British reserve and aspire to the impulsive and breezy nature of Americans. But when Loomis Gage, an eccentric millionaire, invites him to appraise his small collection of Impressionist paintings, Dores's plans quite literally go south. Stranded at a remote mansion in the Georgia countryside, Dores is received by the bizarre Gage family with Anglophobic slurs, nausea-inducing food, ludicrous death threats, and a menacing face off with competing art dealers. By the time he manages to sneak back to New York City–sporting only a cardboard box–Henderson Dores realizes he is fast on the way to becoming a naturalized citizen.